The real-world guide to successfully funding your nonprofit program The Complete Guide to Fundraising Management is the comprehensive handbook for successful fundraising, with a practical focus that applies across the nonprofit sector. With a focus on planning, self-assessment, continual improvement, and high-payoff strategies, this book provides more than just ideas—it shows you the concrete, real-world actions that make it all happen, and gives you the tools you need to bring these concepts to life. This new fourth edition features the latest information about social media campaigning, internet fundraising, crowdfunding, and more. Timelines, checklists, and forms help you streamline management tasks to focus on effective development, and updated sample reports and budget information help you begin implementing these approaches quickly. The nonprofit world is becoming increasingly competitive in terms of funding, and fundraisers are being asked to perform miracles more than ever before. 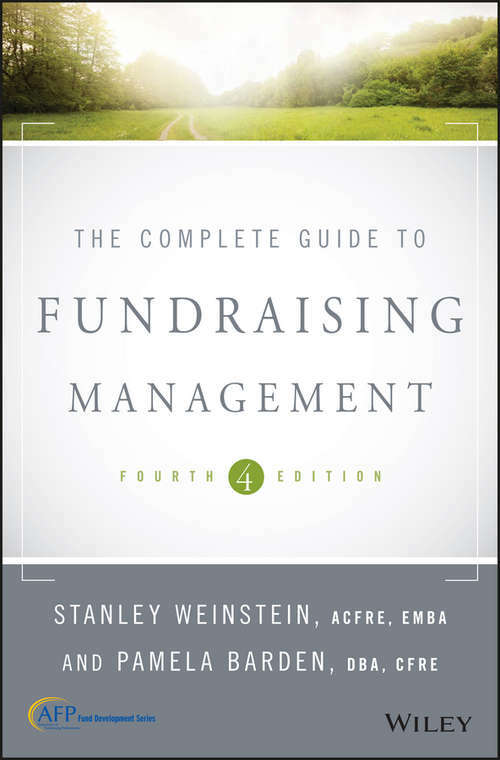 This book offers a time-tested framework for fundraising success, with step-by-step guidance through the entire process from prospect to program. Understand and apply the major principles and best practices of fundraising Manage information, resources, development, and volunteers Adopt new approaches to relationship-building and prospect identification Write grants and fundraising materials that make a rock-solid case for support There is never enough funding to go around. To survive and thrive, nonprofits must revitalize interest and generate more support. Gone are the days of door-knocking and bake sales; strategy is critical, and execution must be top-notch. The Complete Guide to Fundraising Management shows you the real-world strategies that get your programs funded.